NASA is working to resolve an increasingly frustrating problem with the Curiosity Rover’s drill, which has stalled, leaving the Martian explorer out of action on the slopes of Mount Sharp for more than two weeks. On December 1st, scientists at the Jet Propulsion Laboratory learned that the Curiosity Rover failed to execute its latest drilling commands. The rover was scheduled to drill its seventh hole of the year and its sixteenth rock since arriving on Mars in August of 2012. For two weeks after glitching out, Curiosity stayed put while engineers attempt to diagnose and fix the problem. Recently, it has started driving around and making observations again, but drilling remains off-limits. Curiosity’s drill bores into rocks using a combination of hammering motion and a rotating drill bit. Since early in the mission, an electrical malfunction has caused problems with the hammering mechanism, but drilling has proceeded in spite of that. About a year ago, Curiosity encountered another issue, when the motor that opens a sample processing chamber stalled out. 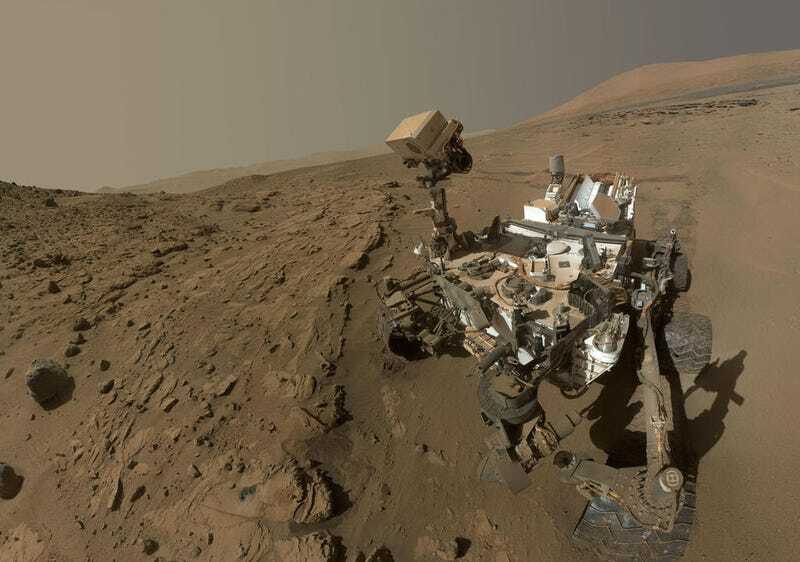 “That problem was intermittent but has recently gone away,” Curiosity’s project scientist Ashwin Vasavada told reporters at a press conference at the American Geophysical Union meeting last week. The Curiosity Rover is slowly climbing Mount Sharp, the central peak in Gale Crater, an impact basin that is believed to have harbored a saltwater lake billions of years ago. At regularly-spaced intervals, Curiosity is drilling boreholes to measure mineralogy and organic materials. The rover is currently situated in the Murray formation, a diverse band of mudstones which are proving to change dramatically with elevation, yielding insights into Mars’ past environments and habitability. It would be a shame if Curiosity’s latest investigation was cut short due to something as minor as a hyperactive drill brake. But when you’re operating machines beyond their expected lifespans and tens of millions of miles from the nearest mechanic, minor glitches can mean the world. “Although the rover doesn’t want to be a stick in the mud, it sort of is,” Curiosity deputy project scientist Joy Crisp said. Correction 12/20: A previous version of this post stated that the Curiosity Rover was staying put while engineers attempt to diagnose the drill problem. While this was true for the first two weeks of December, over the past week the rover has begun driving again. The text has been updated to reflect this.